Black Ice Software - Print2Email version 10.02 is released! 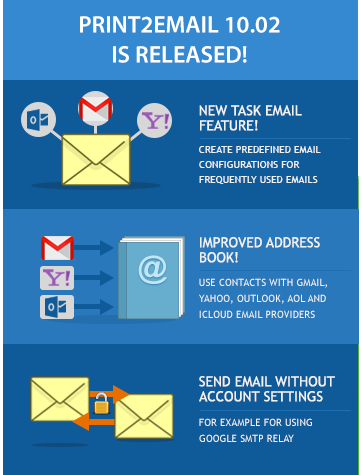 New Task Emails feature to create predefined email configurations for frequently used email addresses! Black Ice Software has released version 10.02 of the Print2Email. The new version of Print2Email includes new Task Emails feature, allowing the creation of new printers with predefined email settings. By using the Task Emails the user can create separate printers with pre-defined emails for routine tasks without having to repeat email configuration steps each time. The user can create as many Task Emails as necessary. Print2Email 10.02 includes "Send email without account settings" feature for SMTP and Exchange mail servers, allowing the usage of Google's SMTP relay with Print2Email, and also includes significant improvements for printing PDF documents. The latest Print2Email includes improved usability of the imported email contacts with Gmail, Yahoo, Outlook.com, AOL and iCloud email providers. Stability improvement for using the "Overwrite the existing file" and "Rename the new file" text output options with custom file naming.